The ZUP Series provides the broadest range of single output, zero-up, stand-alone programmable power supplies available today. They provide the ideal solution for a wide range of laboratory systems and industrial applications. The ZUP Series provides the flexibility required for the ATE and system needs of today. The digitally controlled front panel is easy to use, and provides precise control of the power supply output. The ZUP Series has models from 200W to 800W with a range from zero to sixty volts. All models are backed by a 3 Year Warranty. 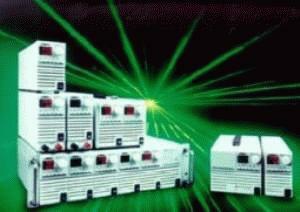 ZUP has standard 85 - 265VAC, Wide Range, Single Phase input with Active Power Factor Correction. An embedded RS232/485 Interface is contained in the standard package saving space and allowing versatile serial interface communication. GPIB programming is available as a separate unit option, which communicates to the power supplies over the RS485 line. A rackmount Kit enables up to six units to be mounted in 19" Rack (800W is two units wide).